Y'all, I am addicted to organization. Seriously. 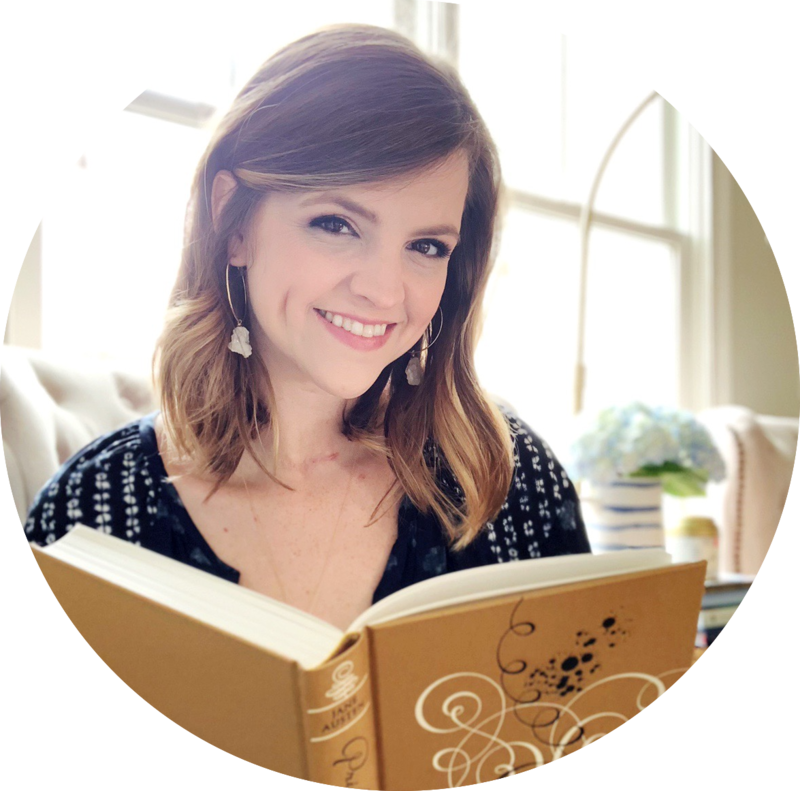 Whether I'm organizing my closets, rearranging my bookshelves or planning out blog posts, it's one of my favorite things to do! I've written before about how I use May Books to brainstorm posts, and earlier this year shared I shared by book blogging to do list printable. 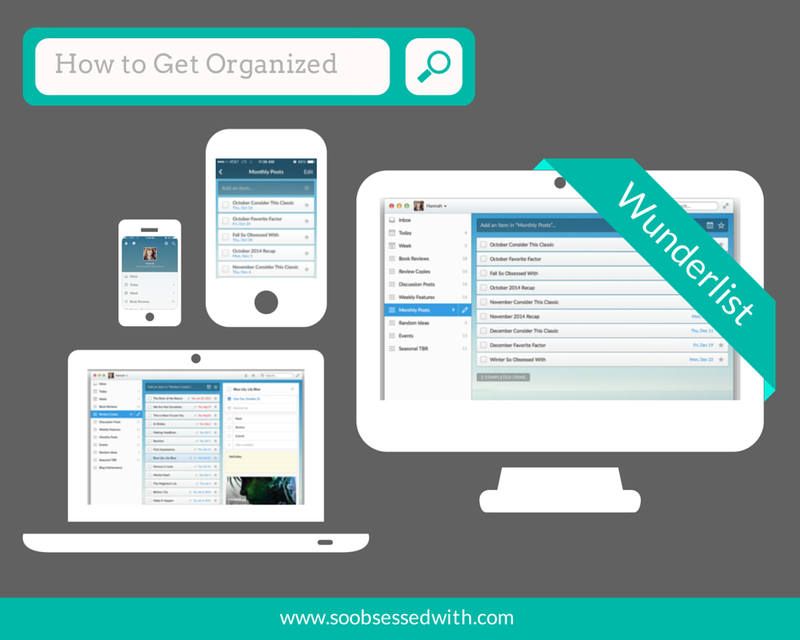 But what if you prefer to get organized digitally? Sometimes it's just more convenient to have it on your phone or computer. A few weeks ago, I was texting Cassie (Queen of Technology) about how I don't have many apps on my phone. I mentioned to her that I just used the built-in Reminders app for my to do lists, but I wanted something with a) more functionality and b) a more appealing design. She suggested a few options, and then I started testing. The winner was clear almost immediately: Wunderlist. I've been using it for my blog, and I'm obsessed! 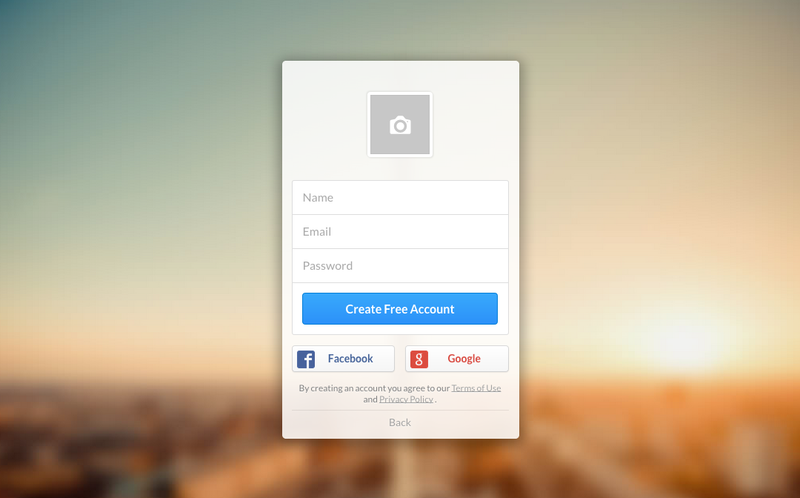 Create Account: It's very easy to create an account with Wunderlist. I did it from my computer, but I believe you can also sign up from the app on your phone. Provide your name, email and a password, and you're ready to go! Once your account is created, you can upload a profile picture, choose from some of their backgrounds, adjust your settings and start making your lists! Free vs Pro: I use the free version and think it will work for most users - Pro is more for teams or businesses. 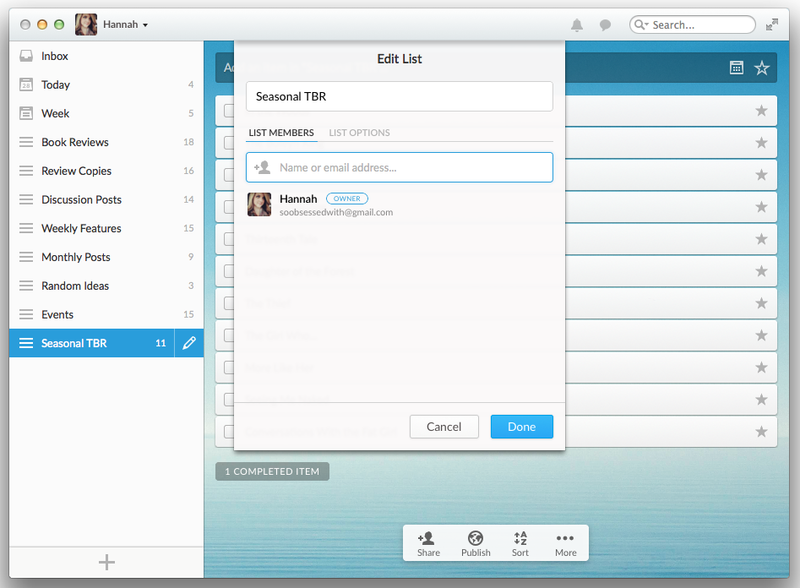 With Pro, you can Assign Tasks to an unlimited amount of members of a shared list (Free is limited to 25 assigns per shared list), upload almost any File of any size (Free is limited to 5MB per file), access additional Backgrounds (Free has 20, Pro has 30) and create unlimited Subtasks (Free is limited to 25 per to do). I don't think you'll need Pro, but you can upgrade at anytime ($49.99/year or $4.99/month). Availability: Wunderlist is available anywhere, anytime. It's free on iPhone, iPad, Android, Windows Phone, Windows 8, Mac, Chromebook, Kindle Fire and the Web. I downloaded the app on my iPhone and the app for my Mac, and I love using it on both. Although I bookmarked it on the web, I prefer having it on my desktop. It uses real-time sync, too, so it instantly keeps my lists up-to-date - no matter how I'm accessing it. So, let me show you why I love it! Screenshots are from the Mac app. Book Reviews: As soon as I finish reading a book, I add it to this list. I'm notoriously awful at reviewing a book before I start the next one and I read quickly, so I often have a backlog of reviews to write. Review Copies: I used to keep track of these in a spreadsheet, but this is so much easier. Every review book gets listed, and I add the release date, contact info, subtasks, etc. An example will be below. Discussion Posts: I frequently have ideas for discussion posts, and I've saved them all over the place - random pages of my May Books, draft posts, notes on my phone. Now I just add them here! Weekly Features: For me, this is Top Ten Tuesday topics. I've added every one that's on the schedule with the applicable due date. I may not participate in all of them, but I like having them there. Monthly Posts: I have a few monthly posts (Consider This Classic, Favorite Factor, etc.) and those go here. I like having these on a separate list since they often involve other bloggers. Random Ideas: This is my catch-all list. Any ideas for collaborations, new features, miscellaneous posts... If it doesn't fit anywhere else, it goes here. Events: I haven't really hosted many events, but I have a few currently in the works with other bloggers. Everything I need to write or do for these goes on this list! Seasonal TBR: I just added this list after last week's Top Ten Tuesday. I often read all of the books from my seasonal TBR, and I love being able to glance at this list anytime I'm choosing my next read. While writing about my different lists, I thought of another one: Blog Maintenance. I'm going to use that list for recurring tasks like updating my Review Archive, my Books Read page, the On My Nightstand sidebar item, reminders to leave comments - or to respond to them, etc. If you add due dates to items on your list, they'll appear in your Today or Week view (when they're actually due today or that week, of course). This shows the Week view, and Today is pretty much the same but would only show those four items in the top. Technically, the four today items are overdue for me - review copies that have now been published - which is why the list name is in red. In this view, you can see what's due each day of the week. If I'd already completed an item, it wouldn't appear on this list. It notes what list the item is saved on, which is why I love having lists that are a little more specific. The pushpin icon means that an item has subtasks associated with it. Here's what you'll see if you actually click on a list. Because I'm crazy about organization, I like to sit down with a calendar and fill out what I want to publish when. For example, I want monthly recaps to publish at the beginning of the new month. The date doesn't mean it's scheduled to publish - that's my goal for when I'd like it to be published. Once it is scheduled, I mark it as complete. Completed items are noted at the bottom. To create a new list, you'd just hit the + icon at the bottom of the lefthand sidebar. To add an item to a list, you just type in the box at the top of the list and hit enter. When adding an item, you can click the calendar icon to add a due date and/or to make it a recurring task. But you can do both of those things later, too! If you have a co-blogger or if you're collaborating with another blogger on a feature or event, you can Share the list with them. Once they're added to the list, you can also Assign Tasks to them. I haven't used this functionality yet, but I love that it's built-in. 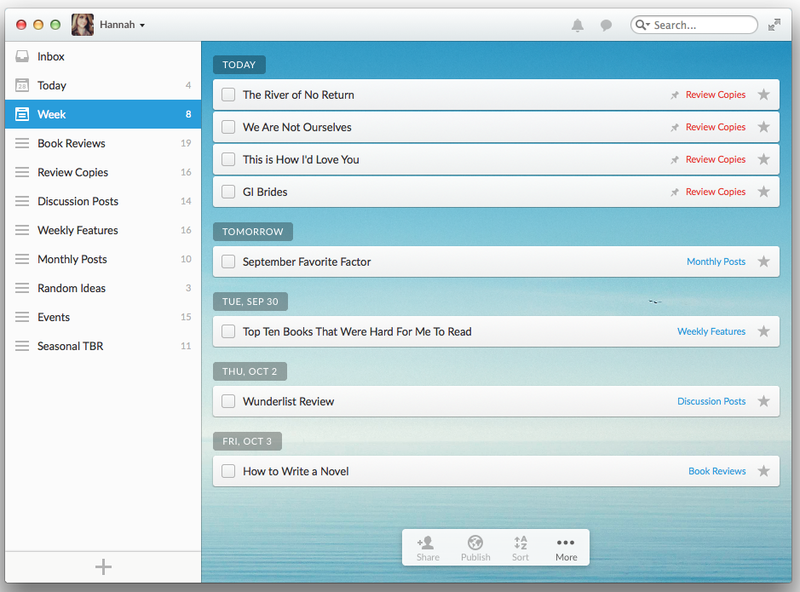 You can also leave comments on list items, which eliminates emailing back and forth. I love that, too! Since I haven't shared any lists yet, I haven't used two additional features: Activity Center and Conversations Center. The bell icon at the top notifies you when there is new activity on a shared list (adding or completing items). The speech bubble icon is dedicated to comments, @mentions and replies. If you have multiple people using a list, it's a great way to stay on top of changes or updates. 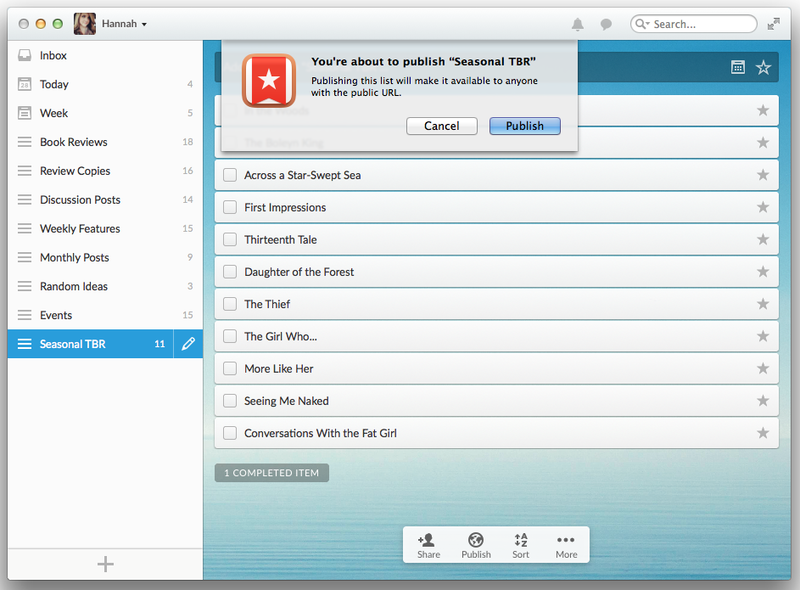 I haven't used this functionality either, but you can Publish any list that you create in Wunderlist. This makes the list available to anyone with the public URL. Unlike with shared lists, this doesn't add everyone as a member of the list - they can simply access it. I don't see myself really using this feature that often, but it's there. There are a number of ways to sort your lists - Alphabetically, By Due Date, By Creation Date, By Assignee and By Priority. The way I sort is based on the list I'm in - Review Copies is by due date, for example, but Book Reviews is by creation date. 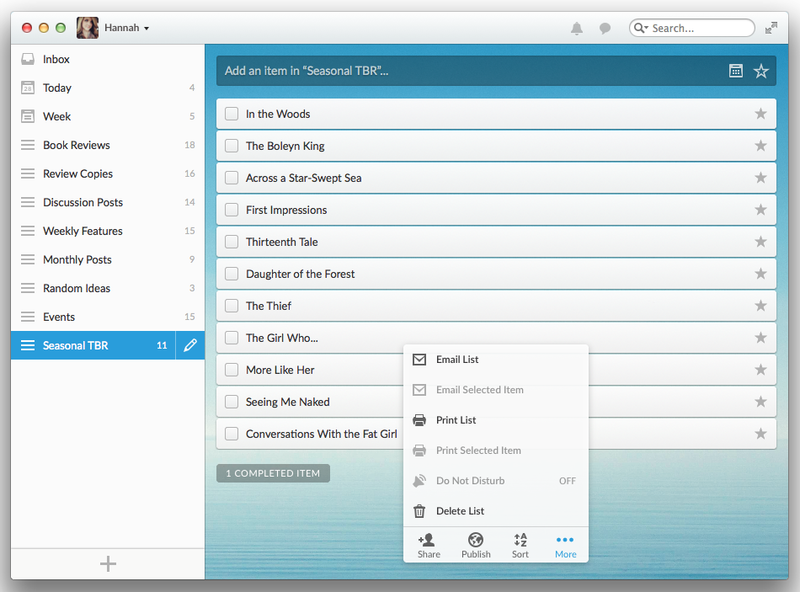 You can also easily drag items up or down within a list. You can also do that with the order of the lists in the sidebar! You can Email or Print either an entire list or a selected item from a list. If you have a shared list, the Do Not Disturb function mutes all notifications unless you're assigned something or mentioned in a comment. I've mentioned a few of these things, but here's an example of all the options available once you select an individual item. You'll see that I've added a Due Date, which is the book's release date. You can easily change the date or make it a recurring event from here. Select Remind Me to choose a date and time to be reminded to do an item. For example, you could set a reminder for a week before a book's release! Next, Subtasks. I think this is when I first realized that I loved this app! 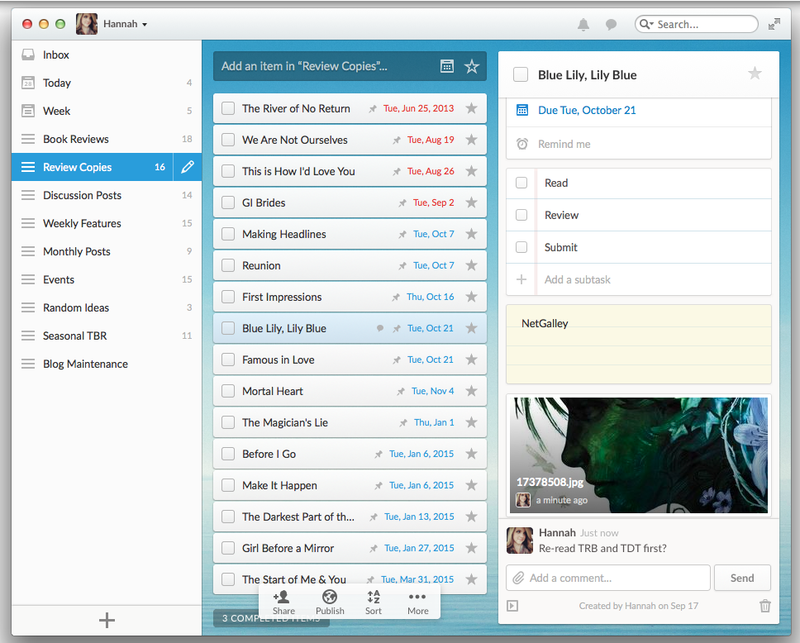 Since there are often multiple steps involved in posts, I'm obsessed with subtasks. For a review book, I like to have subtasks for: a) reading it, b) writing my review and c) submitting the review. 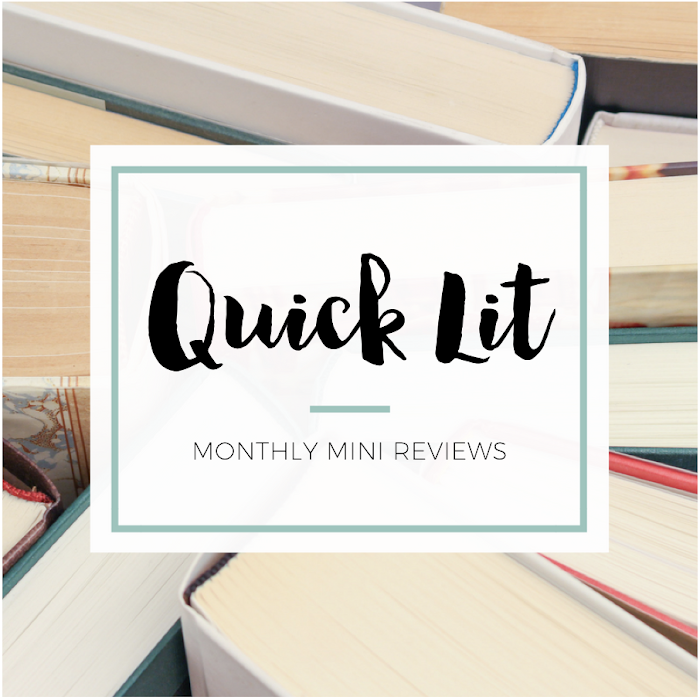 For my monthly recap posts, I have a subtask for each section of the recap since I often work on that post throughout the month. Then, you can add Notes. For review books, I write down where I got the book and, if it's not NetGalley, the email address / contact information for the person who sent it to me. That way I have everything I need when I go to submit my review and don't have to search for their original email. You can add Attachments, which I've done here with the book's cover. You can then save it on your computer or you can share it (Options: Email, Messages, AirDrop, Facebook, Twitter, and Flickr). Finally, Comments. I added a comment regarding re-reading the previous books in the series as an example. Since this isn't a shared list, I'd just add that to the notes section normally but this is how a comment looks. Again, this is particularly useful if there are multiple people using the list. If an item is important, you can Star it. It then becomes a priority item and is added to the Starred list so that you can quickly see all of the items you've flagged. Everything I've highlighted in this post is also available in the mobile app! It's so easy to navigate the app, make changes or updates... and it still looks great while you're doing it. Since I always have my phone with me, I've fallen in love with the simplicity and convenience of accessing Wunderlist that way. 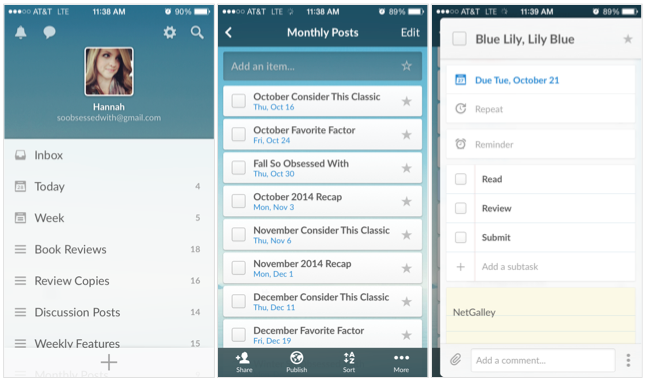 Do you use any apps to keep you organized? Oh my goodness! Thank you for sharing! I've been trying to find a way to keep organized with blogging, and this looks like it would be very helpful. And I love those May books! So cute! I looove Wunderlist. I have been using it for a long time for personal tasks & todos but haven't really used it for blogging, other than keeping a running To Review list. I never thought of getting this in depth with it for blogging, though, and I really like it... I've set up a couple new lists. 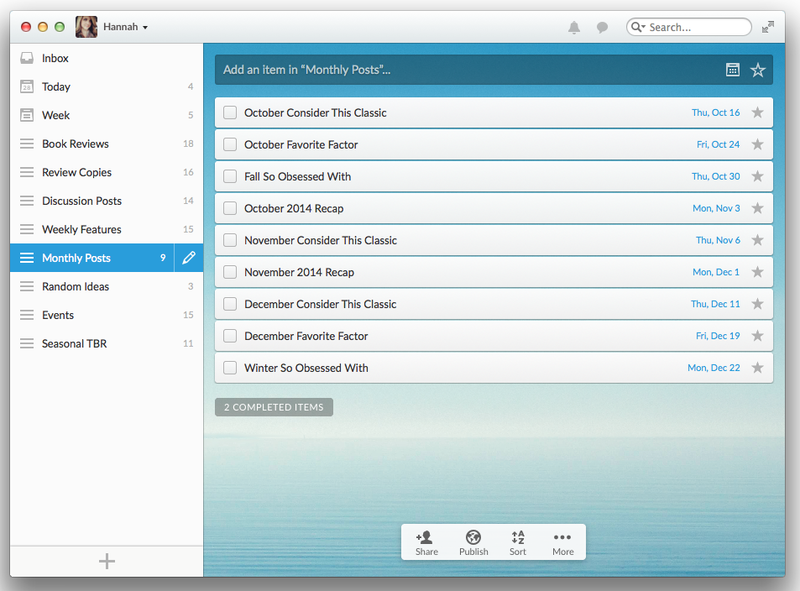 You are so right - the subtasks are an amazing feature!!! Ooh this sounds like a very useful tool. I recently learned about another similar tool and started using it with my co-blogger. Organizational sites like this really do help make blogging easier, as long as we remember to check in right? Wow, just wow, you officially made my day. 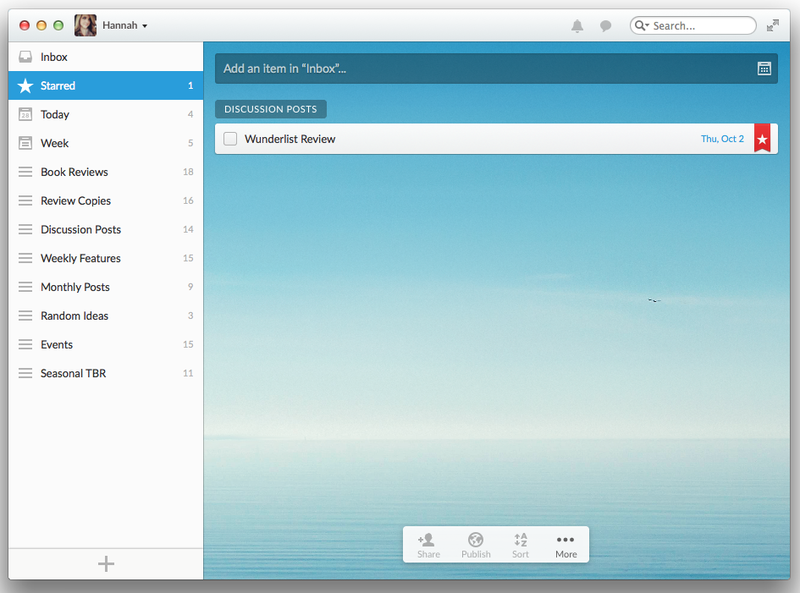 I tried Wunderlist before but could not figure out how to use it for my blog. 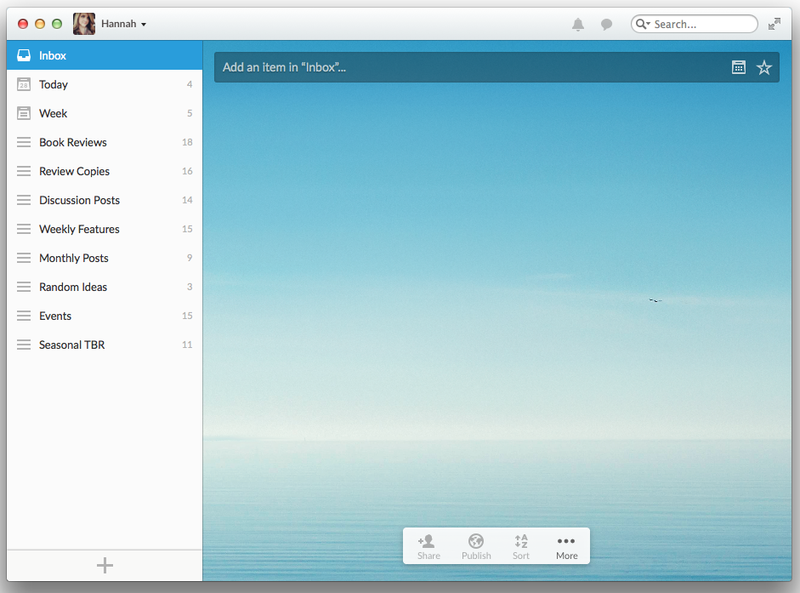 So I used Evernote, but for some reason I can not make it really work for me, I use it, but I miss features. Wunderlist, I have set up some lists and then we have sub tasks, OMG I had no clue you could actually add sub tasks? Thank you so much for sharing this Hannah, thank you so much, this makes my blog life so much easier! . I love lists! This looks amazing. Totally checking it out this weekend. I think the only comment I can make on this post is: It convinced me to download Wunderlist, and now I'm addicted to making lists and checking items off. Seriously, Hannah, you're a wonder at finding all these organizational tools! I don't know how I was operating with Wunderlist previously, but I'm tremendously enjoying all the advantages of it now, thanks to you! 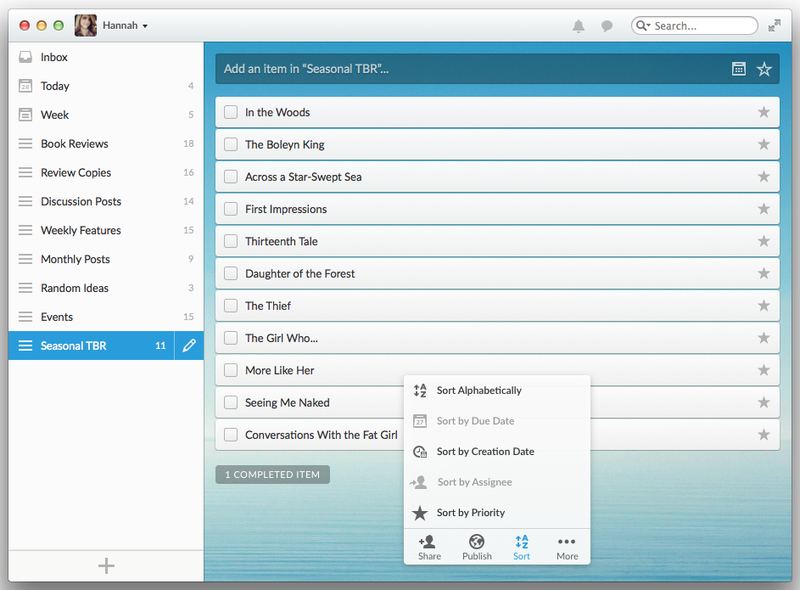 I've been using Wunderlist for a while now but did not know about subtasks. I'll definitely have to try that out. I've been looking for something like this for a while now. It sounds perfect and wonderful review. Thanks so much.